When it comes to Kingsmen basketball, there are a lot of people excited about the potential for this season. With a team full of skill, Kegan Hoskins could be a key deciding factor on Penn’s success. Hoskins is a 6-foot-5 junior for Penn and is a talented two-sport athlete. On the basketball court, Hoskins is averaging 7.4 points and 5.2 rebounds a game. He has swatted away 11 shots and made 17 steals. “I feel like my role is to go on the court and be intimidating and tough inside,” Hoskins said. Hoskins is also thrilled about this basketball season, saying there is a lot of potential for success. He said that while the Kingsmen have a good offense with some lights-out shooters and rebounding ability, the team needs to work hard on defense to really prosper. Hoskins is also expected to be a force for Penn’s Baseball Team. For high school athletes, summer break is often a time dedicated to improvements in their respective sports. Hoskins said that over the summer, a lot of time is eaten up by his travel baseball team. However, between tournaments he said he makes sure to get in some basketball. Typically, when Kegan works on basketball, he’s looking to improve his hook shots, dribbling skills, as well as his shooting range. Hoskins has high expectations for the Kingsmen Basketball Team in the State Tournament. 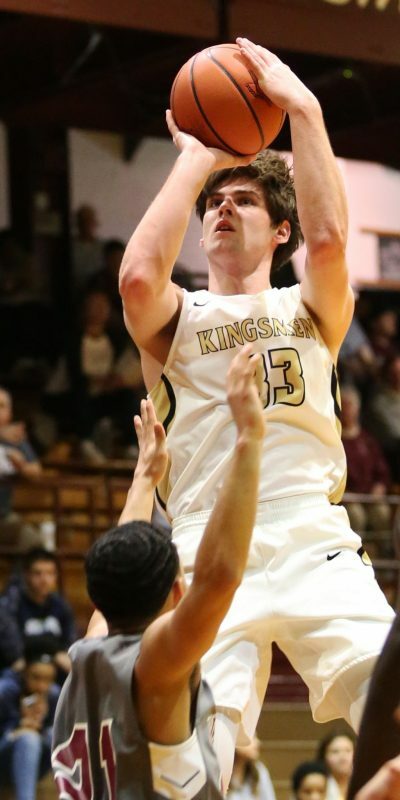 There’s no question about the excitement surrounding the Kingsmen Basketball Team, and it’s obvious that Kegan Hoskins will play a big role in that.